It feels like Davinci has been listening and learning from the feedback they get from their clients, with the Davinci Miqro really stepping up to the plate. While every vaporizer has its advantages and disadvantages, the Miqro at first glance appears to be a well-balanced vaporizer. Some of the most noticeable features of the Miqro are the full temperature spectrums and smart paths, replaceable battery options, and their new pearl design for different chamber sizes. One of the new advantages of the of Miqro is that cleaning it is a lot easier than Davinci’s earlier models. That means more time for sess’s and less time cleaning your vaporizer. That’s an advantage in anyone’s books. Before we break it down any further, the Miqro isn’t perfect. It’s great, but it has a few smaller issues. We couldn’t get more than 2-3 sessions out of a single charge. If you love vaping with friends, then you’re going to want to invest in a set of spare batteries. Currently there are two versions of the Davinci Miqro Kit… Below as shown is the contents of the “Explorer” kit. If you’re looking for a small portable vaporizer that’s stealthy or portable, then the Miqro is going to be perfect. Taking it out on the town, hitting it at concerts and festivals, or for a sneaky session at work. That’s where it steps up. If you sess at home with your friends or like to vape all day long, then maybe the Miqro isn’t the dry herb vaporizer for you. Size and Portability – The Miqro is one of the smallest dry herb vaporizers available on the market. It fits easily into the palm of your hand or slips into a pocket. Don’t let the small size fool you though. It’s packed full of features. Build Quality – So far, no problems. We’ve had a few sessions with it, and the Miqro seems strong and feels like it’s high-quality. It’s comfortable in the hand, but the unit itself can get a bit hot after a longer session. Heating – It takes about 30-40 seconds for the Miqro to hit its temperature. You might want to go a little hotter than you’re used to if you like vaping hot. Vapor Path – The vapor path on the Miqro is Ceramic Zirconium, which makes it easy to clean. Temperature Options – The full temperature spectrum on the Miqro allows you to vape anywhere from 300F-400F and also features standby mode and boost mode. Smart Path Technology – This is a pretty cool feature. You choose a Smart Path, 1-4, and then the Miqro will start at the lower temperature and gradually increase to the higher temperature throughout your session. Boost Mode – When you hold the button depressed in boost mode it rapidly heats the device and keeps it at maximum temperature for as long as you hold down the firing button. Standby Mode – This cools down the Miqro and helps to conserve your battery life. 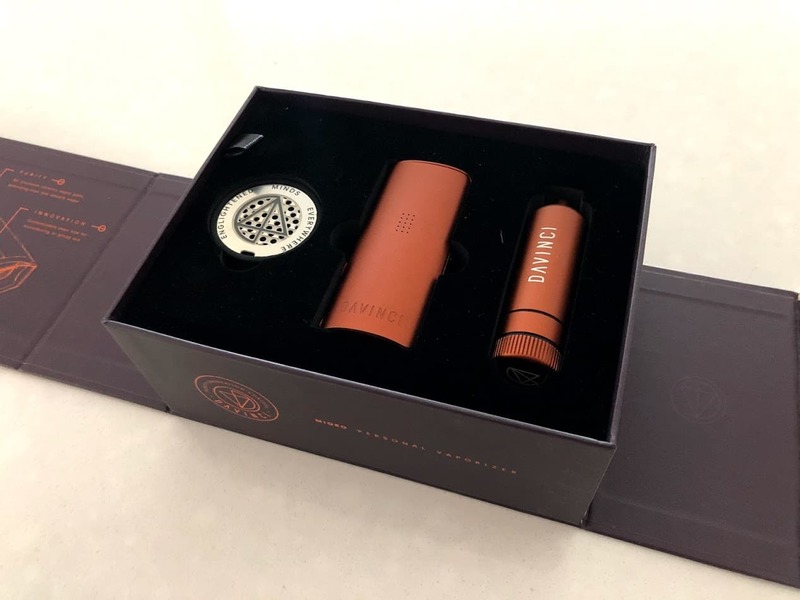 Overall, the Davinci Miqro Vaporizer is a great addition to any vapers collection, as long as you’re buying it for what it is, a great portable vaporizer. The smaller battery life isn’t ideal for longer sessions at home but taking it out for a quick sess it’s a great little vaporizer. Unfortunately, we do still prefer the Davinci IQ over the Miqro for it's battery life, vapor consistency and versatility. But for us, both devices are great conversation starters and perform well just remember to bring an extra battery around.